We usher in the peace and sanctity of Shabbat by lighting candles every Friday evening and on the eve of Jewish holidays. The candles bring peace into our homes, and add light and warmth to a world that sometimes feels dark and cold. The candles are lit eighteen minutes before sunset. Some communities, such as those in Jerusalem, have the custom of lighting the candles and bringing in the Shabbat earlier. In that case, light the candles as per your community custom. Find times for your area. The earliest one may light the Shabbat candles is plag haminchah on Friday afternoon. Plag haminchah, one and a quarter daylight hours before the end of the day. See our Zmanim page for when that is in your location. The latest you may light the candles is just before sunset; after sunset, Shabbat has begun even if you have not lit the candles, and handling or lighting a flame is a desecration of the Shabbat and forbidden. On holidays, you can light later as well, provided that you use a pre-existing flame. 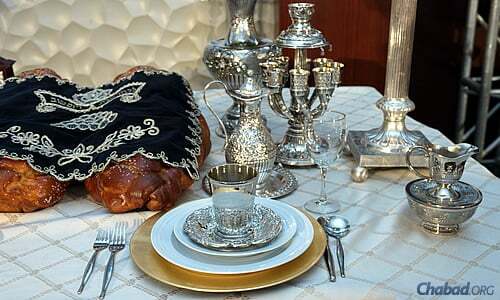 When a holiday follows Shabbat or a holiday (eg. the second day of a two-day holiday), the candles must be lit after nightfall. Click here for times, procedures and blessings for the holiday candle-lighting. Read: Why are candles lit 18 minutes before Sunset? Sign up for free SMS or email reminders or get the Shabbat Times App. 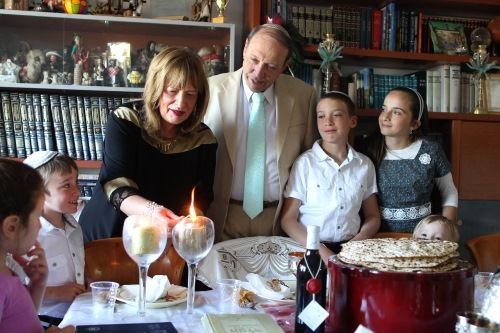 The mitzvah of lighting candles has been given especially to women, the mainstays of the Jewish home, but it is an obligation for every home, and if no woman over bat mitzvah is present to light, the candles are lit by the man of the home. As soon as a young girl can understand the significance of Shabbat and can say the blessing (at approximately three years of age), she should kindle her own Shabbat candle. 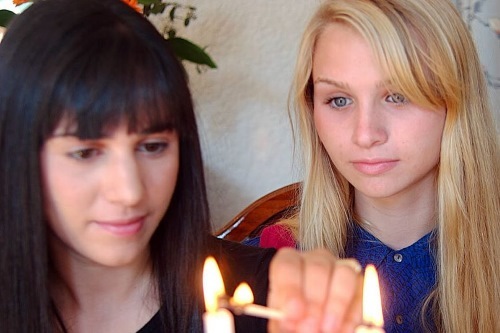 Read more: Do Young Girls Light Shabbat Candles? Single girls and women light one candle. After marriage, women light two — and some have the custom of lighting one candle for each member of the immediate family. Candles are lit on or near the table where the Shabbat dinner will be served, to add to the light and joy of Shabbat. It is customary to give some coins to charity before kindling the Shabbat candles. Before we pray to G‑d and ask Him kindly to grant our deepest wishes, it is appropriate to display kindness to others. After you've given charity and removed the charity box, light the candles. A girl should light before her mother, so her mother can help if necessary, and is also forbidden to light her candle after the proper time. After you’ve lit the candles, do not put out the match. Rather, drop it on a fireproof surface or give it to someone who has not yet accepted Shabbat . Use your hands to shield your eyes from the flames and recite the blessing while your eyes are covered. The time of candle-lighting is considered particularly auspicious for private prayer. 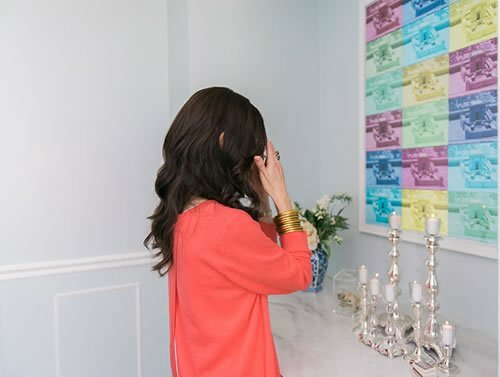 Women have traditionally prayed, as they stand with eyes closed, for health, happiness, children who will illuminate the world with Torah, and the ultimate Redemption which will be ushered in by the Messiah. Girls, too, offer their own prayers at this special moment, as they discover the beauty of a practice which will enlighten their entire lives. Once you light the candles and recite the blessing, you have accepted Shabbat. As fire is muktzeh (set aside, and forbidden to move) on shabbat, the candles and candlesticks may not be moved until the conclusion of Shabbat. May it happen soon. Amen! Read: Where does the Torah say to light Shabbat candles? Read: What are Shabbat candles? What Are Shabbat and Holiday Candles? Reading about the ceremony of candle lighting and the speaking of the bessing, I would say the blessings are much more important. There is a debate among contemporary authorities about reciting the blessing over electric candles. The consensus is, if someone is hospitalized, where the use of fire is prohibited, they may rely on the opinions that allow reciting the blessing over an electronic candle. She may not simply make a blessing on the already lit candles. However, Ex post facto, if it is after sunset, but still during "twilight" (i.e. before nightfall ) she may ask a non-Jew to light a candle for her and afterward, according to the Shulchan Aruch Harav (263:11, Kunteres Achron 4) she may recite a modified blessing 'al Hadlokat haneirot' (since she isn't actually lighting the candle). WHat about a man lighting the candles? Why not? how can a small match burn continuously ? A poster ask "What can you do if you, for some reason, don’t have candles or something to light them with? "Rochel Chein for chabad.org answered in response to Electric candles that "Real flames should be lit whenever possible. Using a electric lights should only be done where an open flame is not possible, such as when in the hospital."